Quilt, ‘Goodnight, sleep tight’, machine-pieced / hand embroidered, wool, Jocelyn Campbell, Australia, 1990. Made by Campbell, Jocelyn in Australia, Oceania, 1990. Quilt, 'Goodnight, sleep tight', machine-pieced / hand embroidered, wool, Jocelyn Campbell, Australia, 1990. Around the field are four concentric borders; the inner border embroidered around the right and lower sides with flowers and with the text "Sleep dwell upon thine eyes, Peace in thy breast, would I were sleep and peace so sweet to rest. To sleep perchance to dream, for in that sleep what dreams shall come. Good night. Good night." The second border is pieced from squares and the occasional triangle, embroidered with names eg Anna; James; Tim Ivan 1950; Emily; Jeremy: Alex; the third border is striped or check wool; and the wide outer border of brown wool textured with a woven checked pattern. The quilt is backed with the same checked brown wool fabric and embroidered with a poem by Dylan Thomas. Poetry & text, embroidered on the front, around the right and lower sides: "Sleep dwell upon thine eyes, Peace in thy breast, would I were sleep and peace so sweet to rest", "To sleep perchance to dream, for in that sleep what dreams shall come", "Good night Good night". Text, embroidered on the back: "In my craft or sullen art/ Exercised in the still night/ when only the moon rages/ and the lovers lie abed/ with all their griefs in there arms,/ I labour by singing light/ not for ambition or bread/ or the strut and trade of charms/ on the ivory stages/ But for the common wages/ of their most secret heart", "not for the proud men apart/ From the raging moon write/ on these spinarift pages/ not for the lowering dead/ with their nightingales and psalms/ But for the lovers, their arms/ Round the griefs of the ages,/ who pay no praise or wages/ nor heed my craft or art/ Dylan Thomas.". Designed by Jocelyn Campbell with the intention of making a quilt using only materials from her collection. The relationship between Jocelyn Campbell's wool quilts and traditional Australian waggas is particularly strong, visually and emotionally as well as through the use of wool fabrics. This quilt was inspired by images of isolated Australian pioneer women of past times making quilts to warm their families by firelight, by how necessity inspired their creativity, and by the pleasures of recycling materials. The embroidered texts are a combination derived, with contributions from her mother, from family tradition, poetry by Dylan Thomas, Shakespeare, and Tim Christian, for whom the quilt was made. The embroidered flowers began as a way of covering the moth holes in the wool cloth, and gradually grew as a design feature as the quilt progressed. The use of embroidery to decorate the piecing seams is also reminiscent of late 19th century crazy quilts. Jocelyn Campbell's association with wagga quilts was recognised in the NSW regional gallery touring exhibition 'Beyond the wagga', for which she was invited to make a contemporary wagga, write a catalogue essay, and assist with selection. Made by Jocelyn Campbell. The quilt is machine pieced from favourite woollen fabrics collected by the maker over many years. It is hand embroidered, and the corners of the blocks tied, in lieu of quilting, with buttons given to the maker by her aunt. These buttons represent for her the family button collection. Duration of making was six months, as indicated by the maker. Assigned date of 1990 in Diane Finnegan's book 'The quilters' kaleidoscope'. Intended for practical use as a bed quilt. The quilt was originally made for a friend of the maker, Tim Christian, to celebrate his 40th birthday. It was displayed in the Australasian Quilters' exhibition "Quilt Exhibition '91" at Burton and Garran Hall, Australian National University, Canberra in September/October 1991, although not listed in the catalogue. 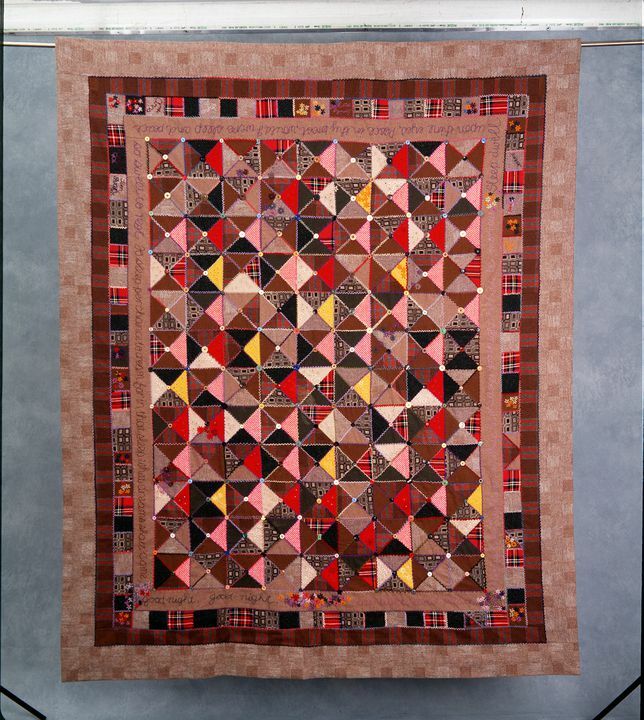 In late 1995 and early 1996, the quilt was briefly in the possession of the maker's brother in America.